In the words of Tyrion Lannister, "You're in the great game now. And the great game is terrifying." Ready your sword for battle as you vie for the Iron Throne. This new version of the classic strategic conquest game takes Risk to new worlds—Westeros and Essos—and epic new heights of play. 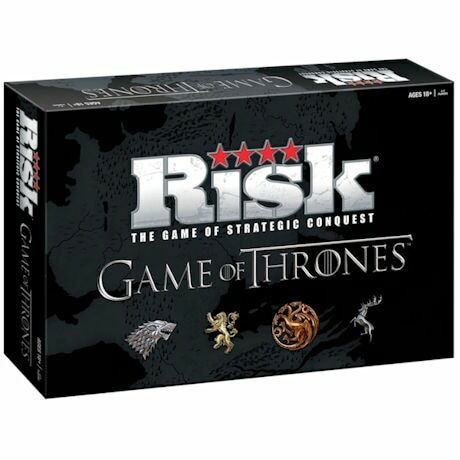 Compete as one of seven houses (Martell, Stark, Baratheon, Lannister, Tyrell, Targaryen, or Ghiscari); choose among three ways to play on two game boards. The hundreds of pieces include intricately carved armies and golden dragon coins. Winter is coming, and you need a good, long game. For 2-7 players, ages 18 and up.